Protesters burnt pictures of the reclusive state's leader, Kim Jong Un, as around 800 people gathered for a march. Hundreds of anti-North Korea protesters scuffled with riot police outside the Winter Olympics stadium in South Korea on Friday, hours before two of the North's most senior officials were due to attend the Games' opening ceremony. Protesters burnt North Korean flags and pictures of the reclusive state's leader, Kim Jong Un, as around 800 people gathered for a march towards the stadium where the Olympic torch will be lit in what Seoul wants to become a symbol of peace. North and South Korea are still technically at war after their 1950-53 conflict ended in a truce, and the North faces ever-tightening international sanctions after it conducted a fresh nuclear test last year and a series of missile tests. 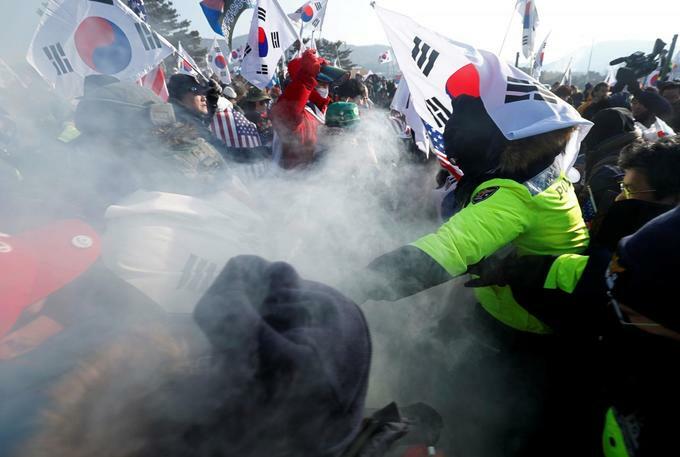 Protesters scuffled briefly with police and criticised South Korean President Moon Jae-in, who is using the Olympics to re-engage with the North and pave the way for talks over the reclusive state's nuclear and missile programme. They carried banners reading "Moon Regime is leading Korea to destruction" and one that made an appeal to U.S. President Donald Trump: "Mr President. North Korea bombing, please." The North Korean leader's younger sister, Kim Yo Jong, will be in the audience on Friday night, the first member of the country's ruling family to visit the South. She and the North's ceremonial head of state will be on hand to watch teams from North and South march behind a unified flag.